A lot has happened since we last posted to our blog. On September 26, 2014, the Final Environmental Impact Statement was released by the Arizona Department of Transportation. We are currently within the 60-day review period which ends November 25, 2014. The Final Environmental Impact Statement can be downloaded by chapter at ADOT’s FEIS page here. According to ADOT’s Loop 202 Fact Sheet ADOT has stated that they plan to have a final “Record of Decision” ready by 2015. So where do we go from here? 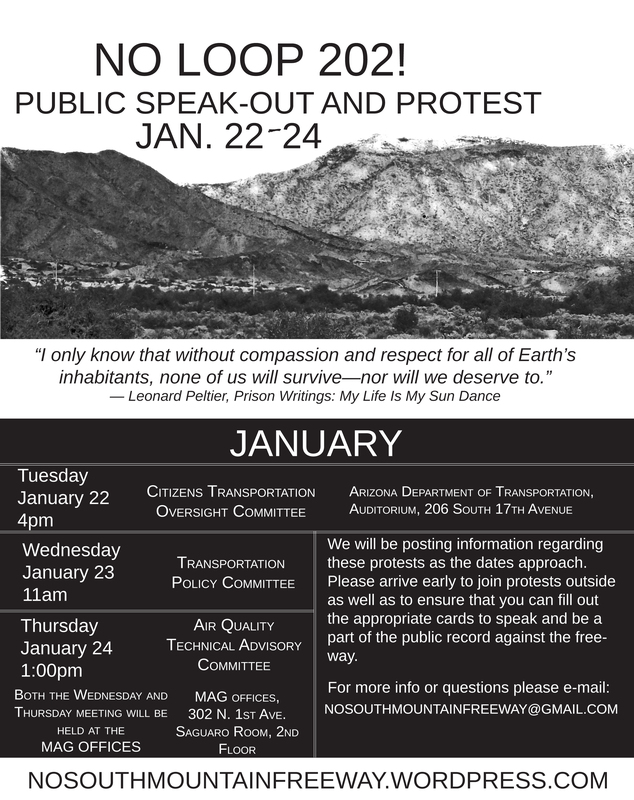 First, it is important to mention some recent actions that have happened against ADOT’s proposed Loop 202 project. -On October 8, an event promoting the Arizona Department of Transportation’s expansion of the freeway. was crashed by Opponents of the freeway. Protestors crashed the event and sent a clear message by announcing through megaphones in the middle of their lunch space that this freeway will not be built! On October 14, an Anti-columbus day call-in to the organizer of the October 8, pro-freeway event. It was held to further solidify that we will not allow pro-freeway supporters to go smoothly down the road with the loop 202 project. As we move closer to the November 25, date of the comment period closing we can all work to spread the word of where this project is at and help encourage others to join future events against the freeway. As individuals we can all take it a bit further and plan our own responses to this freeway. This very existence of this proses to expand the Loop 202 is a threat our own existence. It is a clear example of present day colonization. Furthermore, it is an enormous attempt on the side of the state to commit large-scale ecocide to everything natural which still exists within Phoenix. All four O’odham tribes are under attack by this proposed freeway and need the support of others to help shut this project down! We plan to announce future actions and events to attack this project and protect our future. We can not allow the state to destroy what is sacred for the sake of international trade and capitalism. This freeway is part of an international attempt to orchestrate the rise trade via-CANAMEX and NAFTA ( see our post onLoop 202 as a Corridor of the Future) style policies that destroy the lives of people across the globe. This is much bigger than just widening a freeway, so lets expand our resistance and plan to shut it down! 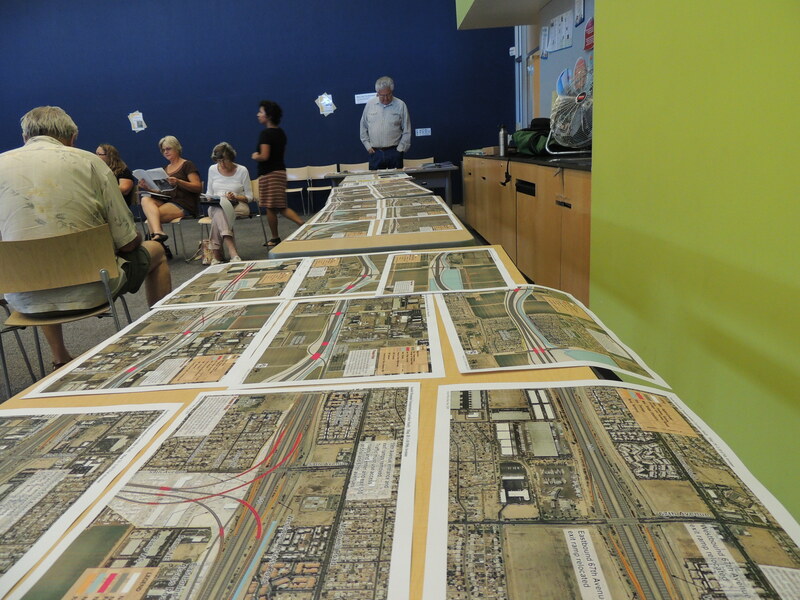 On Tuesday July 23rd the No South Mountain Freeway group held an informational meeting at the Laveen, Cesar Chavez Public Library. 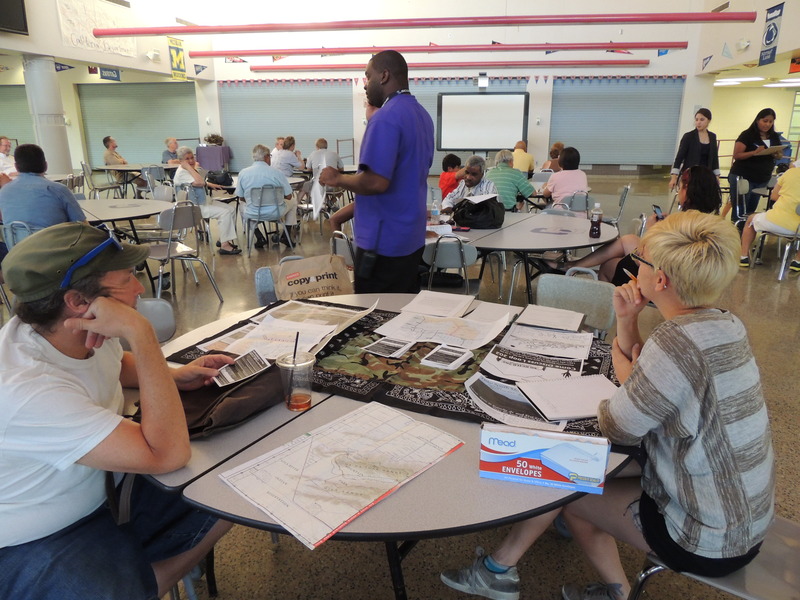 The meting was held to provide a space in Laveen where information regarding the proposed expansion of the Loop 202 could be presented from a No Build perspective. Needless to say, finding opposition to the expansion of the Loop 202 in Laveen may seem like a finding a needle in a haystack. However, resistance has been multiplying as access to freeway resistance increases; and all of the voices against the freeway remain sharp and to the point… No Loop 202! (To view a copy of our handout which includes an updated timeline and articles pertaining to resistance to the freeway please click here or the image below. 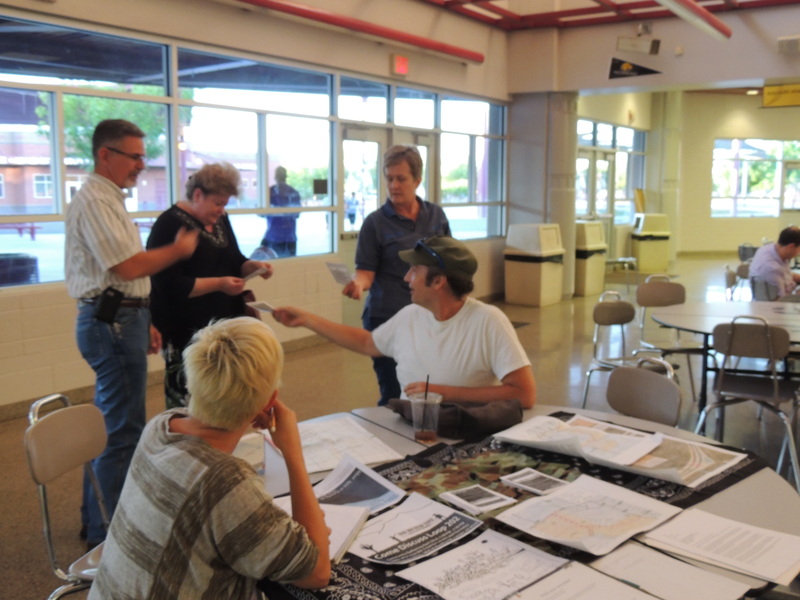 Even after recent Environmental Impact Statement (EIS) public meetings hosted by the Arizona Department of Transportation (ADOT), the people of Laveen still desire more information regarding the Freeway. Especially pertaining to impacts the freeway would bring to their once small farm town village. During the round of introductions to our presentation, nearly every attendee expressed they were there to obtain more information. One family whom seemed frustrated with the freeway’s nearly 30-year stalemate, were willing to listen to the No-Freeway side even though they lean toward the build stance. The attendee’s farm is located within extremely close proximity to the freeway’s “Right-Of-Way” (the area in which the state could attempt to exercise their use of eminent domain to apprehend property for the routes expansion). The family has been attempting to determine if their farm was in the crossfire of the Right of Way. Part of the presentation focused on “Eminent Domain and Property Rights”, both being areas in which we continue to research in further detail. It has been and continues to be our uncompromisable stance to resist any expansion of the freeway; we don’t want ADOT’s use of eminent domain to reach the point of Property Acquisition. However, a veil of mystery as thick as the summer smog continues to leave the common persyn a bit in the dark when it comes to understanding the actual process of acquisition. Hence our feeling the need to present on the subject as there are property owners and tenants that wish to better understand this process that looms before them. At the recent DEIS public hearing meetings held by ADOT throughout the valley, there were two publications by the US Department of Transportation Federal Highway Administration, the first on Acquisition and the second on Relocation. The presentation reviewed the purpose and the process outlined in these publications. The Acquisition publication is all about “Just Compensation” and reviews that process. According to the Fifth Amendment of the Constitution, “private property may not be taken for public use without just compensation.” Once acquisition has occurred, (the Relocation publication goes over this process) Property owners and tenants are entitled to the protection of the Uniform Relocation Assistance and Real Property Acquisition Policies Act of 1970; amended in 1987, otherwise referred to as the Uniform Act. The Uniform Act’s purpose is to provide fair and equitable treatment for those displaced from property. 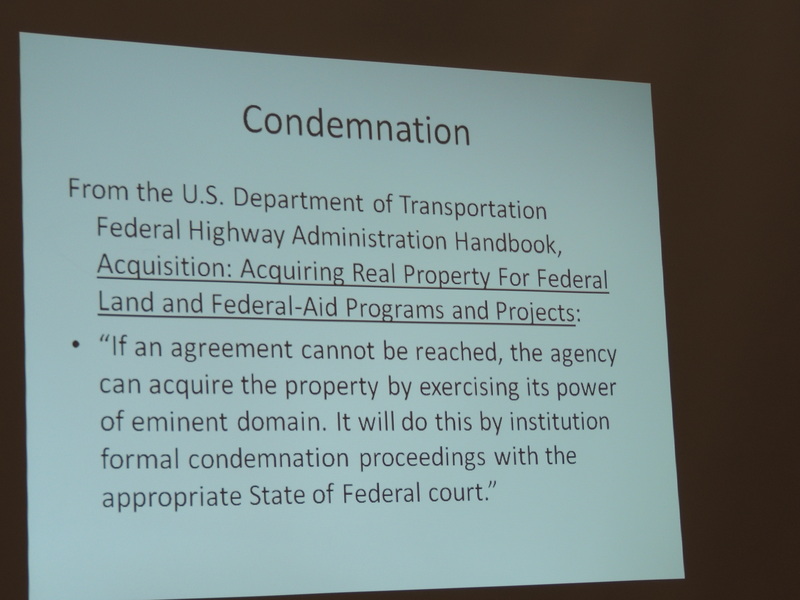 Through the Acquisition process, if an agency and property owner cannot come to an agreement on just compensation, then the agency practices its use of eminent domain. Eminent domain laws vary from state to state, and the Arizona Eminent Domain laws can be found online, scroll down to Chapter 8: Special Actions and Proceedings Relating to Property, Article 2. We hope to continue to distribute this information to the public, especially to those along the direct route and surrounding communities. Eminent Domain Laws are immensely complicated and convoluted. The need for quality legal counsel continues to grow. If you would like to participate in any part of this process such as researching the laws, lawyers, and going to the directly affected areas, please contact us. The No South Mountain Freeway group is not a stranger to Laveen. The first time members of our group helped give a boost to the no-expansion voice in Laveen was at an event hosted by Michael Nowokowski on February 23, 2012. The Ahwatukee Foothills news published the article, Pangea releases Loop 202 plan on tribal allotted land, which coved both the Pro-Build and No-Build sides of the event. Two No-Build supporters were even interviewed by the Ahwatukee Foothills News regarding the freeway. Earlier that morning, a press conference was held along the proposed route by both councilman Nowakowski and Joseph Perez of the Pro-Build Limited Liability Corporation Pangea. Perhaps the more significant event, which happened that month, was the Gila River Indian Community (GRIC) vote against the freeway, which occurred only two weeks prior to the press conference. After GRIC voted in favor of the “No Build Option”, off-the-reservation freeway supporters were left scrambling to attempt to push the freeway along Pecos Road and then through South Mountain while on the reservation, Perez formed a landowner’s group which began to petition GRIC to rescind the previous 2012 No-Build vote and extend the freeway through GRIC. Currently Pangea is lying low after a GRIC Police investigation found a large numbers of their petition signatures to have been fraudulently gained. 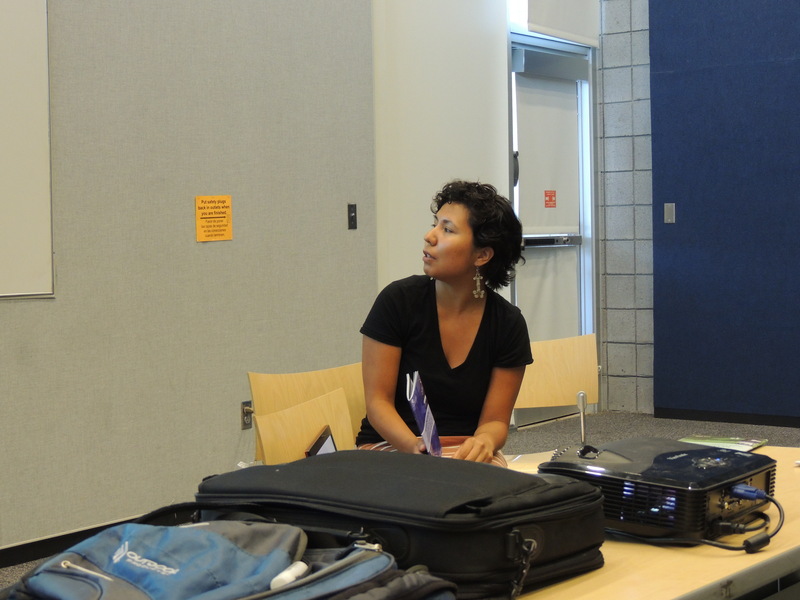 On April 22nd of 2012, we hosted an Earth Day event at the Laveen Library. This event was our initial insight to confusion of residents regarding the freeway. Out of that meeting, we realized the need to compile all of ADOT’s route maps and begin to really understand the route maps so we could help dispel the confusion. 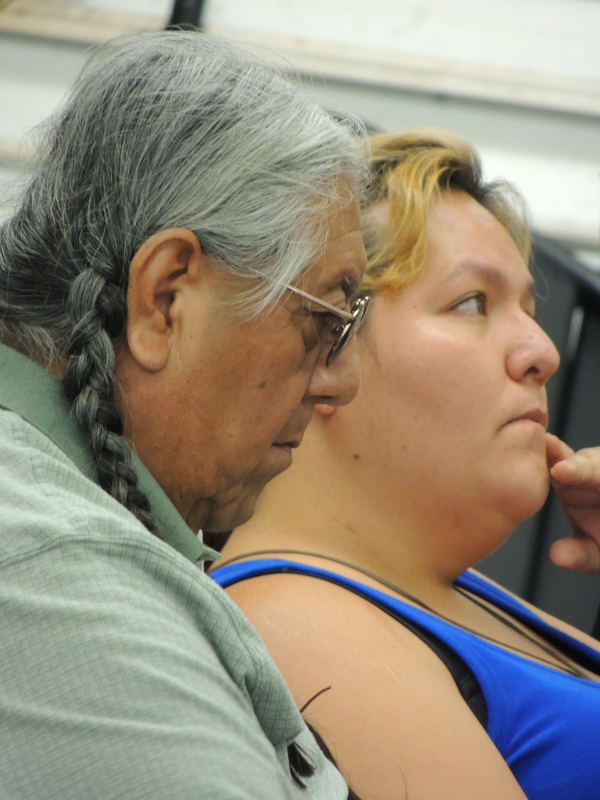 “Members of the Gila River Indian Community and the No South Mountain Freeway group also attended the meeting to protest the freeway and ask some uncomfortable questions of Phoenix City Councilman Michael Nowakowski and State Rep. Ruben Gallego, who hosted the meeting. This next brings us the two most recent events in Laveen being the ADOT Public Meeting Hearing and our most recent event at the library. While handing out fliers for our library event, at the public meeting, two members of our group were approached by a plain-clothed persyn with an earpiece who tried to stop the members before they entered the meeting to tell them ground rules. Upon the request to identify himself, he quickly flashed a business card yet refused to give us one and after one member began to film the incident, the “mystery officer” refused to identify himself and walked away to only stare at the two members of the group from across the building. Despite intimidation tactics to force us out to the parking lot, we were able to gather information from families affected by the freeway and inform about our event. On July 24th of this year, the public comment window closed and a 90-day period begins to review the comments by ADOT. One cannot disagree the significance that the comments to the Environmental Impact Statement Report carry. Yet, how much weight do they carry when it comes to the overall system of transportation running rampant through Arizona. It is not that there are flaws within the insufficiently prepared EIS, it is that the state has allowed this project which originated in the early 80’s to coast into the year 2013 without having much of the public criticism applied to its proposed expansion. The No South Mountain Freeway group has helped organize protests at the meetings of the Maricopa Association of Governments and the Citizens Transportation Oversight Committee as well as making office visits to HDR and politicians that are complicit with the expansion of the Loop 202. While we support the public participation within the comment period, we know that it does not end there and that it will not end the needless expansion either. Further speaking on the Draft EIS, we suggest researching the legal efforts of Protecting Arizona’s Resources and Children (PARC) as they garner resources and strategies to take ADOT to court over a flawed EIS. 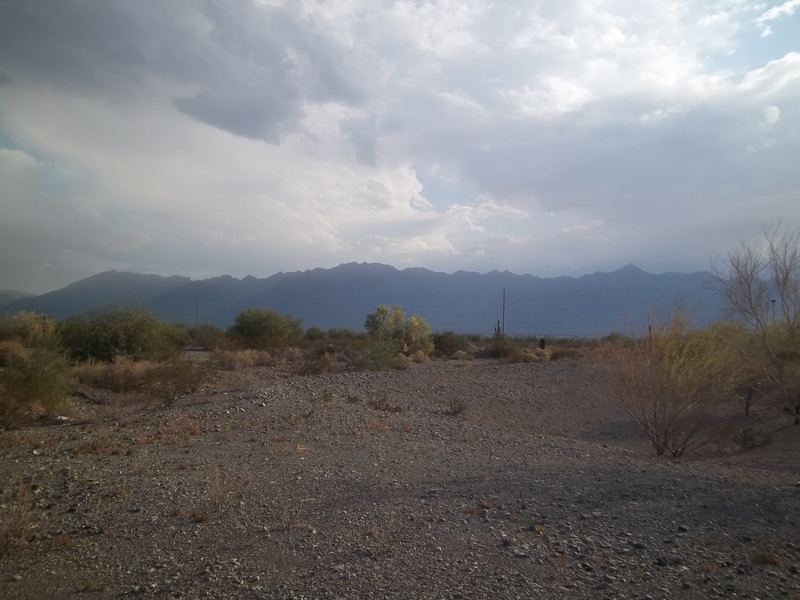 And even more recently, the GRIC-based group Gila River for a Clean Environment (GRACE) has filed a civil suite with ADOT pertaining to cultural impacts that were overlooked within the EIS. There was no hesitation when it came to naming our group “No South Mountain Freeway!” That is due to the fact that our goal has been to point out the colonial origins of expanding the freeway on to the Gila River reservation, holding those supporting the freeway’s expansion accountable to the public and supporting those whom are most affected by the freeway. We continue to venture out to all regions of the Valley where individuals and groups of people are resisting the freeway, whether it be through protest, research, or the organizing of informational sessions such as our last, we uncompromisingly stand beside No-Build as the only option for this freeway. 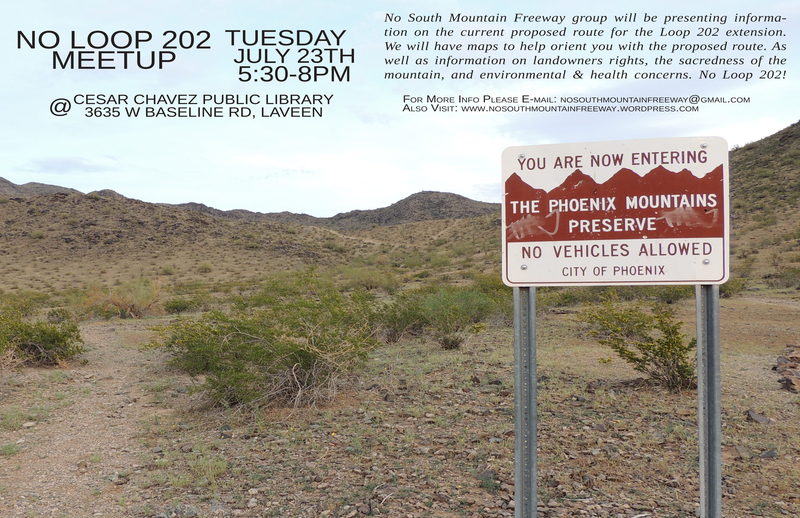 Phoenix, AZ – No South Mountain Freeway Group to host No Loop 202 meet-up Tuesday, July 23. 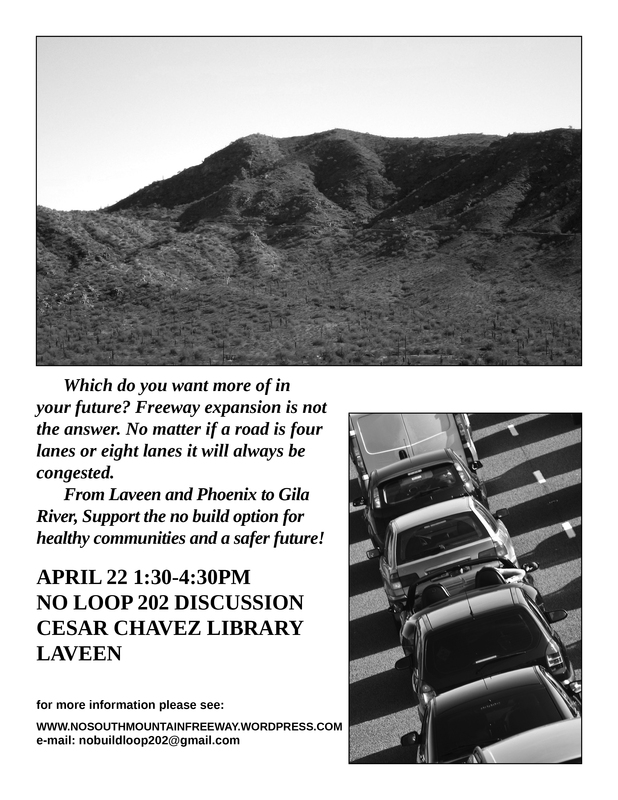 The Group will be presenting information on ADOT’s preferred route for the proposed extension of the Loop 202 freeway, the E1 and W59 alignment, as well as information on landowners rights, the sacredness of the mountain, and environmental & health concerns. One of the main goals of this meeting is to listen to concerns of landowners and those living near the proposed route. We will have information regarding landowner rights on hand if you were unable to get them at one of ADOT’s Environmental Impact Statements (EIS) hearings. We are also helping to initiate a place for those affected by the route to come together and speak to one another. Please feel free to bring your feelings of frustrations with the freeway and share them with others. As a group at this meeting and in the future we hope to help answer questions that individuals and families have. All EIS comments are due by July 24. We will have documents to assist you in making a last minute statement on one of the computers in the library. In addition to a slideshow of photographs of areas at risk of being destroyed by the mountain, there will be maps of the route on hand to look at. Please consider joining us if you want information on routes and displaced person rights information. Hello freeway resistors! We have good news to share about an upcoming event. Members of No South Mountain Freeway will be presenting information on the current proposed route for the Loop 202 extension. We will have maps to help orient you with the proposed route. As well as information on landowners rights, the sacredness of the mountain, and environmental & health concerns. All Environmental Impact Statement comments are due by July 24. We will have documents to assist you in making a last minute statement on one of the computers in the library. In addition to a slideshow of photographs of areas at risk of being destroyed by the mountain we will have maps of the route on hand to look at. One of our other main goals is to listen to concerns of landowners and those living near the proposed route. We will have information regarding landowner rights on hand if you were unable to get them at one of ADOTS EIS hearings. We are also helping to initiate a place for those effected by the route to come together and speak to one another. Please feel free to bring your feelings of frustrations with the freeway and share them with others. As a group at this meeting and in the future we hope to help answer questions that individuals and families have. 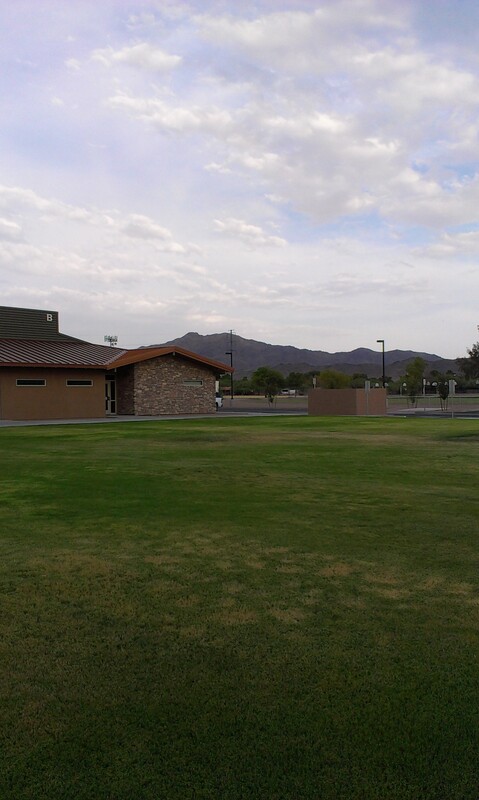 From our recent trip to the Laveen EIS hearing to do outreach. Members of the Akimel O’odham Youth Collective protesting the Pro-202 event in Laveen. The last few weeks have been a whirlwind of events for everyone opposed to the expansion of the Loop 202 freeway. For the No South Mountain Freeway crew we have been busy for the entire month of May. Rather it being drafting and editing statements for the 5-year-transportation plan, asking all the unwanted questions in Laveen or confronting the police as they kick out indigenous youth from a hearing about their sacred site, we continue to be busy indeed. We had the chance to table at the May 11th Public information event on the Draft Environmental Impact Statement (DEIS), which was hosted by Protecting Arizona’s Resources and Children PARC. The main speaker of the event was Steve Brittle of Don’t Waste AZ. He shared his amazing insight on the draft DEIS and did so immensely well. This is a link to talking points regarding the DEIS from Steve Brittle and PARC. Among many others at the PARC event we had the extreme fortune to listen to a story from Michael Tashquinth. Just Last week on May 21, we joined many others from around the Valley to attend the Public hearing on the DEIS at the Phoenix convention center downtown. It truly was a mixture of tense feelings inside the convention center. Between booths of information from ADOT and seats cluttered together to sit shoulder-to-shoulder with their foes. Members of groups such as PARC which have been organizing against the freeway since the early 2000’s shared close quarters with newbie pro-build residents. Members of the Akimel O’odham Youth Collective and the No South Mountain Freeway group peered down the sidewalk as numerous pro-builders were bused to the convention center and greeted by Christi Perez of the Tempe based LLC Pangea. Perez handed out bright green pro-build T-shirts as busloads of valley residents entered the convention center to demand South Mountain be cut into to solve their traffic problems. 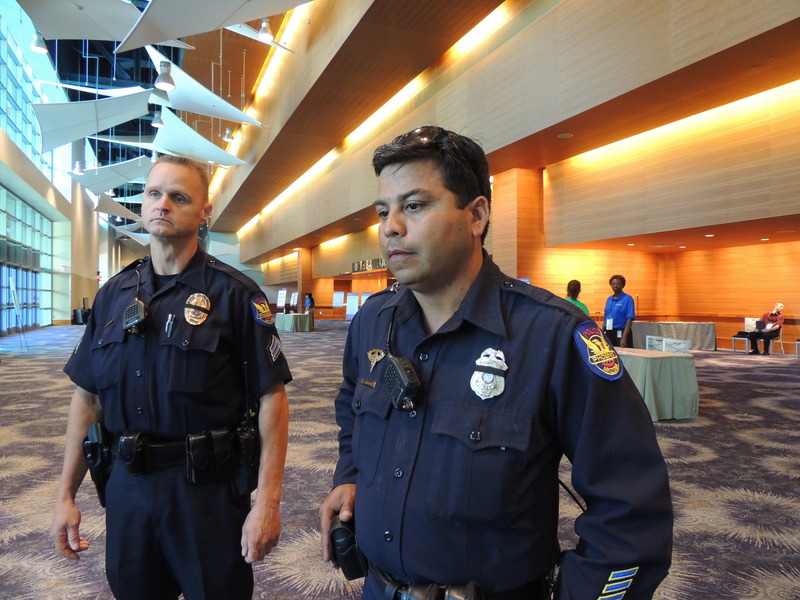 Perhaps the most blatant example of environmental racism of the day came from 2 officers of the Phoenix Police Departments, South Mountain Precinct which kicked out Gilar River Indian Community member Andrew Pedro. According to Joey Perez also of the Tempe based LLC Pangea Pedro “pointed his fingers at him like a gun.” So an officer under the supervision of South Mountain Precinct Sargent Dupra, kicked Andrew out of the event. Perez and Pangea are currently under investigation for fraudulent signatures on petitions to force Gila River Indian Community members to build the freeway on the reservation opposed to the off-reservation alignment that the DEISR has currently been submitted for. By far, providing information regarding the route at both of the Pro-202 event in Laveen and The PARC event has been the best of times for us! Due to the lack of easily accessible route maps and information pertaining to them, we have become a resource to community members attempting to find their homes in terms of the right-of-way “path of forced relocation and destruction” of the Freeway. And this we intend to do even more during the next few months of DEIS limbo. Throughout the next few days we will expand on our report-back of these incredible events. We are also in the process of editing the video to share with everyone later. To veiw a copy of the DEIS you can find it on our Draft Environmental Impact Statement Report page. Last Week to Comment on ADOT’s 5-year Transportation Plan! The ADOT Five-Year Transportation period is coming to an end on Friday, May 17. This link provides all of ADOT’s PDFs of plans and proposal of 5-Year Transportation options and plans, http://www.azdot.gov/fiveyearprogram/, then click on the “Online Comment Form” to add your comments. You can also follow the link, https://www.research.net/s/2014-2018, to Five-Year Transportation Facilities Construction Program Comment Form. akimel o’odham youth collective protesting the 5 year plan in Flagstaff az, thanks to the Taala Hoghan Infoshop for helping out also! from the May 10th rally in Flagstaff! Scenario A: This plan of action seems to be the most long-sustaining solution for Arizona roadways, which projects that pavement quality will fall below standard until 2031. ADOT’s experience of declining revenues for state roadway projects puts itself in a situation that it must make long withstanding and careful plans to maintain our current roadway system in suitable shape for the longest amount of time. The nation’s economic health appears to be recovering in short upticks and the loss of federal funds is hitting nearly every sector of publicly-funded programs. The economy seems to be at a languishing recovery pace, one that may not quickly enough reach the accelerated rate deemed strong and further continue to extend the government slashing of budget spending. At this rate, when will ADOT expect to have a transportation facilities construction program that does not rely on the assistance of the federal government? If ten years down the line, things never recover soon enough to continue to fund public projects, then Arizona will be sitting at the same place it does now. The stance of Scenario A to focus on preservation would keep existing projects in good repair for nearly two decades and does not make the assumption that there will necessarily be more funds to build more projects. The option to bypass Scenario A is uncertain because a decade later Arizona could stand at a place that it cannot maintain its roadways because it has spent so much of it away with the hope that the economy would recover sooner than later. Scenario B: Taking into consideration the forces that brought ADOT to the current highway funding issues, it poses an extremely risky prospect for the existing roadways to be kept in good repair. In a matter of just 3-4 years, pavement quality will fall below acceptable standards. Scenario C: Though a better prospect than Scenario B, this scenario assumes that ADOT’s revenues for projects will return to normal within five years, which cannot be currently be determined or even assumed. ADOT is relying on a quick economic recovery, increase in federal funding, and increase in gas collection which are all too many unpredictable variables in the current state of affairs. ADOT’s Regional Transportation Plan Freeway Program continued efforts to expand the South Mountain Freeway is an imposition on an entire regional community. Recently, The Joint Air Toxics Assessment Project (awarded a 2013 National Environmental Excellence Award) found that the highest health risks, such as higher incidences of development of cancer, are inflicted on communities exposed to toxins near freeways. The research study found that exposure from diesel fuel toxins appears to correlate with increased chances of developing cancer. Given this burdensome cost on residents, it appears that ADOT’s inclusion of the South Mountain Freeway is not so concerned with the well-being of Arizona residents. 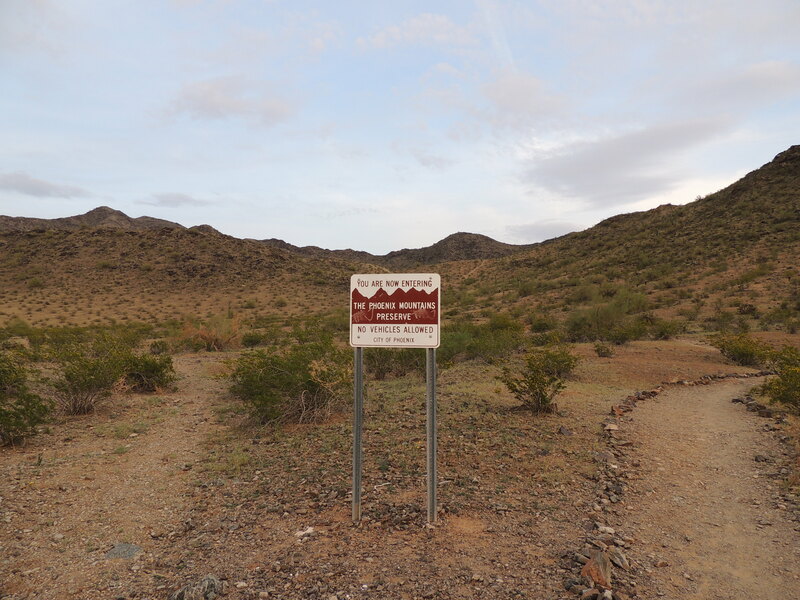 The inevitable disturbance and destruction from the freeways expansion would severely displace Awhatukee, Laveen, and GRIC communities, as well as the treasure that is South Mountain Park Preserve. General Comments: The Arizona Department of Transportation’s Five Year Plan outlines 3 scenarios for the future maintenance and expansion of Arizona’s road infrastructure. Though, the public comment period allows Arizona residents to weigh in on the possible scenarios given budget constraints, it seems that some projects are not even placed in the decision-making power of Arizona residents, that being the MAG Regional Transportation Plan, which continues the planning of South Mountain Freeway. “No Build” is the only option for the South Mountain Freeway. It is an unfortunate reality that in an age that Arizona sits on the cusp of making key decisions for the state’s transportation system, it cannot manage to create a modernized plan of action for the future of Arizona. Each of ADOT’s roadways and transportation decisions are an added building block to the transportation system, which will not only have immediate and short-term effects, but each of these building blocks have a multiplying effect carried out for decades beyond the scope of what planners may now be able to predict in terms of environmental destruction, air quality, and maintaining cultural integrity. Come voice your opposition to the proposed South Mountain Loop 202 freeway extension during the Arizona Department of Transportation’s (ADOT) Tentative Five-Year Construction program public comment period. Join Representative Ruben Gallego and Michael Nowakowski for a planning session in regards to the Loop 202. This a Pro-build group. We will not be arguing the merits of the highway, only how to ensure it gets built. As part of the Draft EIS review process, ADOT will hold one public hearing on the Draft EIS and accept formal public comments. Comments can be provided via comment form,verbal comments to a court reporter, and through three-minute verbal comments in front of a panel of study team members. The public hearing is the only opportunity where three-minute verbal comments can be given in front of the panel. This portion of the hearing will be held for the purpose of receiving comments. It is not intended to be a question-and-answer session. Each speaker will be allocated up to 3 minutes to present his or her comments. Pre-registered speakers will be listed online prior to the hearing and at the public hearing. There are several ways for the public to comment on the Draft EIS. Comments can be submitted by email to projects@azdot.gov, via phone at (602) 712-7006 or by mail to the South Mountain Study Team, 1655 W. Jackson St. MD 126F, Phoenix, AZ 85007. ADOT is also planning a day-long public hearing on May 21 at the Phoenix Convention Center, 100 N. 3rd St.
Public comments must be submitted by July 24.